Keith Earls races clear for his try. IRELAND HEAD COACH Joe Schmidt uttered with a touch of pride “that was what we needed” after a dominant win over France in the penultimate round of the Six Nations. 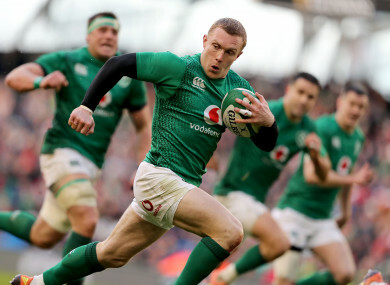 After stuttering through wins over Scotland and Italy after the opening day loss to England, Ireland ensured their defence of the Championship would go on into the final weekend thanks to a 26-14 bonus-point win and tries from Rory Best, Johnny Sexton, Jack Conan and Keith Earls. The result was built on intense first-half pressure as Ireland racked up an incredible 90% territory as they opened up a 19-0 lead at the halfway stage. “I don’t think I’ve seen, in the last six years (since he took charge) a team control a game like we did that first half,” said the Kiwi. “The French got knocked back early and it was hard for them to get back on the front foot. But part of (their) hardship was that we kept the pressure on. To keep that pressure on in the first 40 minutes spoke volumes about the intensity and energy in our game. Schmidt added: “Getting the four tries, getting the bonus point, that was what we needed. As Schmidt alluded to, the win was not without its frustrations. Supporters in the Aviva Stadium were left somewhat cold as France scored two late tries to reel Ireland back from the brink of a record winning margin to a 12-point victory at the full-time whistle. The head coach agreed the bout of sustained pressure could have been broken up if try-scoring opportunities had been taken. However, as he looks on towards next week’s clash with Wales and even towards the World Cup, Schmidt was pleased to see his side return to the peak of their powers while putting the match beyond France. “I know there’s been some frustration externally, it’s been internal as well. On the injury front, a calf problem kept Rob Kearney from starting at the Aviva Stadium today, but Schmidt hopes the fullback will pull through to face Wales in Cardiff next weekend. Robbie Henshaw looks set to remain sidelined, but the head coach would not rule Josh van der Flier out of the tournament finale despite being forced off with a knee injury during the first-half. Email “'It's taken a while, but there was a bit of our rhythm back' -- Schmidt”. Feedback on “'It's taken a while, but there was a bit of our rhythm back' -- Schmidt”.